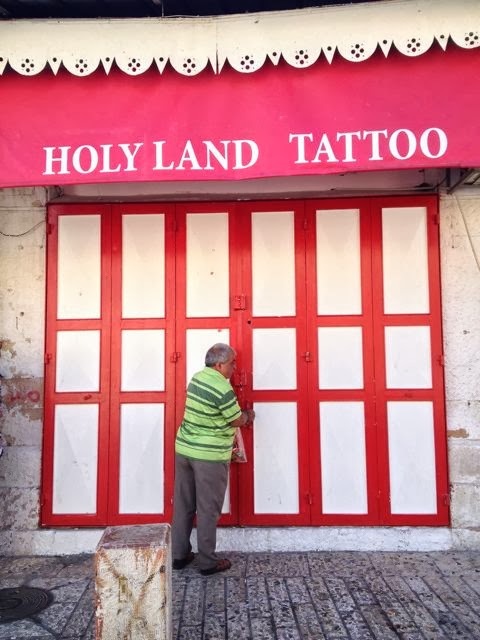 The Holy Sites - A sight for sore eyes? Or, the real reason it's called the wailing wall. It is a right of passage for visitors to Rome, often in for a three-day extravaganza, to ponder the ordeal (and it is an ordeal) of heading over to Vatican City for a day in the Museums (commonly called The Sistine Chapel, which has almost nothing to do with the museums themselves). In reply, I often quip: Just buy the book - you'll thank me later. This has nothing to do with what I truly think of the museum experience, and especially the Sistine ceiling. After all, as Sister Wendy (of PBS/BBC fame) states in my very own loveable audioguide, there, you find yourself standing within an artwork - and with Michelangelo's masterpiece, what a work of art it is! But decades after I first tramped through the hours-long lines to get into the museums, only to find myself so exhausted at the end to not even have the energy to so much crane my neck, well...I've often given this advice. I have yet met a person who has truly enjoyed the full Monty Vatican museum experience. Post visit, they speak of it enthusiastically, but more like something they've survived, like an elephant stampede whilst on safari. To this day, I still cannot understand why the Vatican doesn't just relent and let the 5.2 million tourists simply bolt up that short, sweet, Bramante staircase to gaze up at the ceiling for their requisite 2.5 minutes, let them check it off their 'been there / done that' list and bolt right back down as if one of the horses that may have taken that very staircase and now needed to pee -- really badly. Leaving the 400,000 or so who truly desire to view the artworks, rooms, tapestries, heck even the ugly contemporary religious works to do so at their leisure. As it stands (and you'll be doing an awful lot of that), you end up feeling you are on a rich, but exhausting pilgrimage -- only to find yourself deposited in the most chaotic place on earth; inside a Chapel that is reminiscent of the Roman Forum during the Circenses. Whereas most people speak in hushed tones when entering a place of worship, for some reason (and maybe because of the walk of sorrows to get there), people burst at the seams upon entering the Sistine Chapel. Add to this the automated announcements blaring SILENCE! SILENZIO! at 7 minute intervals and in 43 languages, well, you begin to wonder if Michelangelo didn't have it all backwards; and we are the ones in his version of Hell; not the guys depicted up on the wall. Okay, so what does this all have to do with Israel? Believe me, it's all connected, seeing that that's the place where it all began. 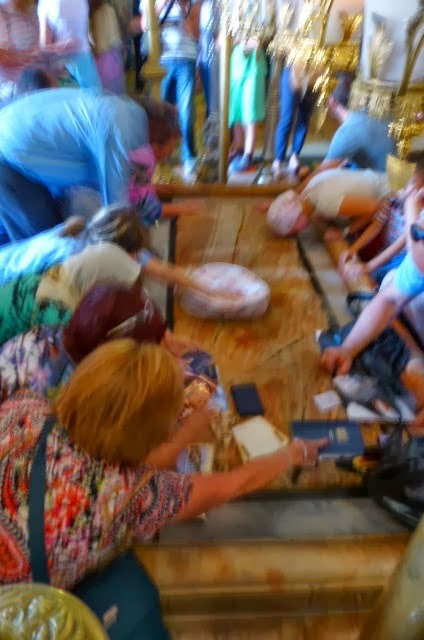 But a visit to the Holy spots in and around Jerusalem, and in particular, the Church of the Sepulchre, well, I had the same spiritual experience; the one in which I thought I was going to meet my maker alright -- by being crushed to death by cruise ship passengers donning baseball caps (inside a church?) as they pushed and shoved to get a closer glimpse of whatever it was in their line of vision (I don't know, I could only see the backs of baseball caps). Looking up, you can tell it is an amazing place, and, I'm sure for millions, quite over-the-top when it comes to items on your religious to-do list. But my experience here left me with a headache; my more religious friends running out the doors to shake the crowds even faster than I -- Turns out that after lighting your candle, a priest quickly whisks them all away so new candles may be lit. My friend didn't want to witness the fate of the candle he had traveled so long to illumine and shot out the door. 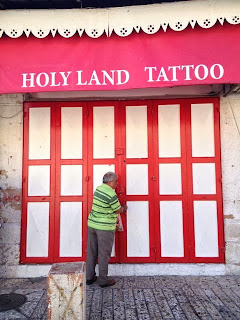 Jerusalem is home to all of the great monotheistic religions, and so you can get the same religious experience no matter where you went. 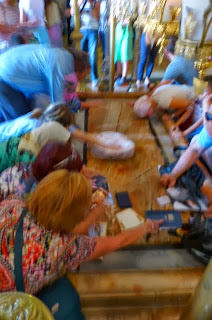 Even at the Kotel - or Western Wall [click here for the webcam]. We were there to attend a Bar Mitzvah, but to our surprise, so were dozens and dozens of other families. The boys, their extended families, their Rabbis and their Torahs were swept into the area, while hundreds of women precariously perched upon plastic chairs around the perimeter tried to catch a glimpse of the ceremonies below. People inside pushed and shoved other groups for space, other visitors made their way to pray, ambulances stood on the ready while thousands more milled about on the slope and marching soldiers came by, guns strapped across their chests. We were all so close, I got to cheer on two boys at once - with women swapping stories and candies amongst ourselves, as if the next of kin. The experience was quite unique, and, out there with the women tossing candies, celebratory -- but spiritual? I would have preferred a peaceful spot under an olive tree to the dodge'em car experience of vying for a space in the piazza, and later on sidewalks while heaving masses headed into the bowels of waiting tour buses just beyond. Finally on our own bus and nestled in the quiet space of my very own seat, I was moved to recite my own prayer giving thanks for having survived my day of spirituality. And while the Dome of the Rock beckoned in the sun, I thanked God that Mecca was not in Jerusalem as well.